2 green bananas peeled and cut into half. 7-8 raisins soaked in a little warm water. 1 big potato cubed into medium pieces-parboil to reduce cooking time. Boil the green bananas in salted water. Then mash them and add all the other ingredients mentioned for the Koftas from green chillies to salt and sugar. Make small balls out of this mixture and deep fry in hot oil. 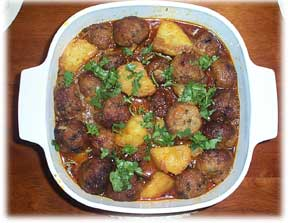 Take out the koftas and drain on a couple of kitchen towels to absorb the excess oil. Next for the gravy, heat 2 tbsps of mustard oil and add the bay leaf and the jeera seeds to crackle. Next add the turmeric powder, hung card, salt and sugar to taste and fry nicely till the oil starts to separate. Next add the potatoes and stir fry for a couple of mins. Then add the fried koftas and coat well with the masala. Lastly add the chopped coriander leaves and garam masala. nice recipe. for egg substitute you can use other binding agent like a cornflower etc. Hi ! Sumana ....Nice Recipe . Awesome pic . Thank U . Green Bananas are gud source of Vitamins , Minerals and contain starch . Rich in folate , Fiber and high in Potassium . Green Bananas boost metabolism increasing the body's capacity to burn fat . Helps in weight loss . Gud for diabetics diet as they are high -energy low calorie source of Carbohydrates . Helps to control blood sugar levels . Boosts Immunity , Prevents Constipation , Protects Intestinal health and Prevents colon cancer . I remember as a child we had banana trees in our garden and my mum would make us so many things out of raw bananas and tis was 1 of those dishes. Thanks 4 sharing.